Earlier today we announced the 2.0 version of our patient engagement solution for physical therapy. This release includes many visual enhancements and several others that operate behind the scenes. It also includes two major new advancements in telehealth technology for physical therapy. We had a soft launch for this new app late in the summer. Today, we are officially welcoming it to the product family with the addition of private exercises. Either there are too few exercises that don’t meet a patient’s needs. Or the libraries are so large and search features so poor that it takes too long to locate the desired exercise. And most common, the distribution of any video exercise to patients is not easy or secure. With today’s release, PTs avoid all three issues. They can use Therapist Essentials on their smartphones or tablets to record a narrated video exercise with the exact movements they want the patient to use. The subject can be an assistant or even the PT if they use the “flip” command of the camera. (Even control the camera remotely…ask us how!) But now, the exercise subject can even be the patient. Just tell Therapist Essentials which patient should receive the exercise video. Record the patient exercising. When done, the app sends the video direct to the patient’s In Hand Health Patient App in a private HIPAA-compliant communication. Create and distribute secure (HIPAA compliant) videos from your smartphone with Therapist Essentials. What’s more, your Physical Therapy In Hand (PTIH) account tracks the patient’s adherence to your HEP and the video until you see them again — just like any other video sent to patients from our solution. Bonus Features: Therapist Essentials also includes access to the PTIH dashboard, patient messaging tools, and progress charts. Our Continuing Care subscriptions provide physical therapy practices with a way to monetize their time and connect with patients between sessions. PT practices customize subscriptions to their services inside Physical Therapy In Hand. Practices can build as many products/subscriptions as they want. They set the prices for each term offered. Simply turn products off and on with a checkbox. To offer a subscription to a patient, just click two buttons. 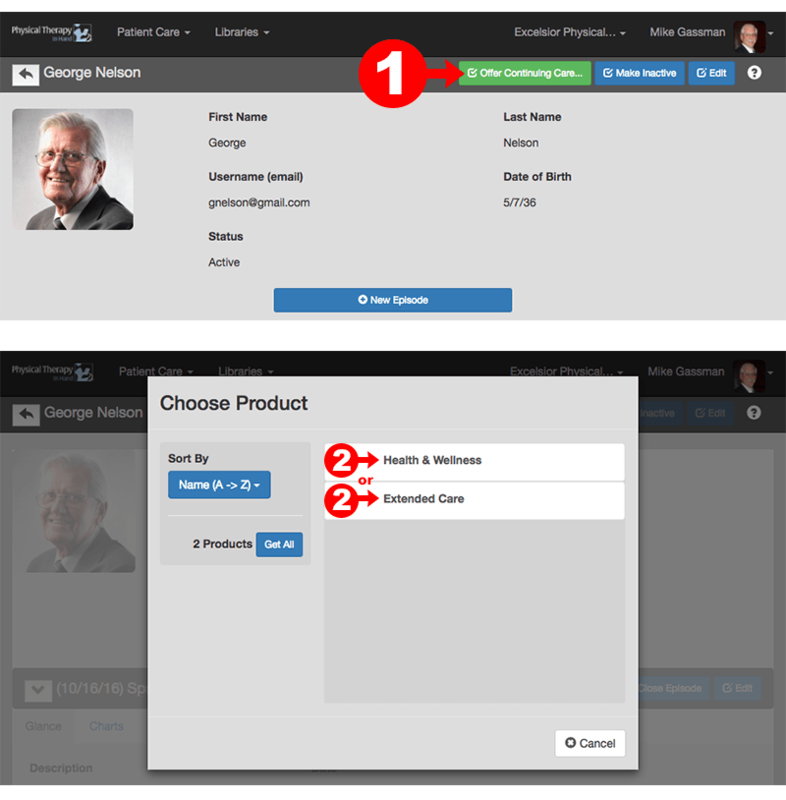 Click two buttons inside a patient’s record to offer him or her a Continuing Care subscription. These actions send an email to the patient with instructions for paying through the In Hand Health Patient Portal with a credit card. We handle all the billing and payments to the practice.